By buying this product you can collect up to 2200 loyalty points. Your cart will total 2200 points that can be converted into a voucher of 0. The Garrett SuperWand Hand-Held Metal Detector 1165800 is a dependable and durable metal detector that features an exclusive 360 degree detection field. The Metal Detector 's 360° Detection field provides uniform sensitivity and detects weapons and other metal objects with extreme accuracy. The Garrett Super Wand Hand Held Metal Detector has an elongated profile that offers tip pinpointing detection and a large 9.5" scan area that allows thorough scanning from head to toe. The sensitivity of the Garrett Super Wand never needs adjusting due to automatic retuning. Also, when the Garrett Super-Wand detects metal, an audible alarm and a visual signal are used as indicators, with the option of a silent / vibrate mode. In addition to the performance of the Garrett SuperWand Metal Detector is its durable construction and versatility. These Garrett Metal Detectors feature a rugged injection molded construction that includes structurally isolated coil for added impact absorption. The SuperWand HandHeld Metal Detector by Garrett also has an ergonomically designed grip that fits comfortably in virtually every hand, making it ideal for right-handed and left-handed users. 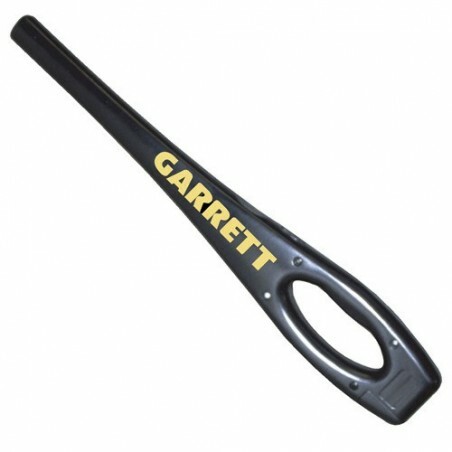 The Garret Super Wand comes with a 9V battery that provides up to 80 hours of operation, and is easy to replace without the need for tools. Lastly, the Garett Super Wand is proudly engineered and manufactured in the USA. These features of the Garrett SuperWand Hand-Held Metal Detector 1165800 make it the hand-held of choice for today's security screener.